At the very centre of the European crisis, in 2013 Greece, after 5 years of extreme depression and severe austerity measures, racism, sexism and generally fascist ideas have reached an intense climax. Finding a political representative in the form of the neo-Nazi Golden Dawn party, fascists repeatedly commit beating ups, even cold blooded murders of immigrants, activists, or anyone they suspect of being LGBT or left wing, often in front of cameras, covered by police’s indifference. It was only after the murder of a 34 year old Greek anti-fascist activist rapper, Pavlos Fyssas, from members of GD -in front of unconcerned policemen, just a week after the brutal assault of Greek Communist Party unionists by 50 GD thugs- that the official state tried to show signs of reaction. Crammed by the strength and popularity of the anti-fascist movement, the coalition government of Greece gave the order for the arrest of 4 of the key members of GD, including its founder. However, the ruling parties are the neoliberal extremists who have imposed measures of violent pauperisation and created the widespread perceptions of decay, victimisation and feelings of national humiliation which fuel the rise of fascism. They are now trying to persuade us that they condemn fascism, while the mainstream media that have been cultivating chauvinism, racism, sexism and anti-immigrant hate for decades now claim that they were unaware of GD crimes. It is an urgent need to create a movement that understands fascism for what it is; the long arm of the system, and will fight it together with its root cause. If we tolerate this, our children will be next! Let’s fight back together against the rise of fascism; against the neo-liberal politics that give birth and support it! 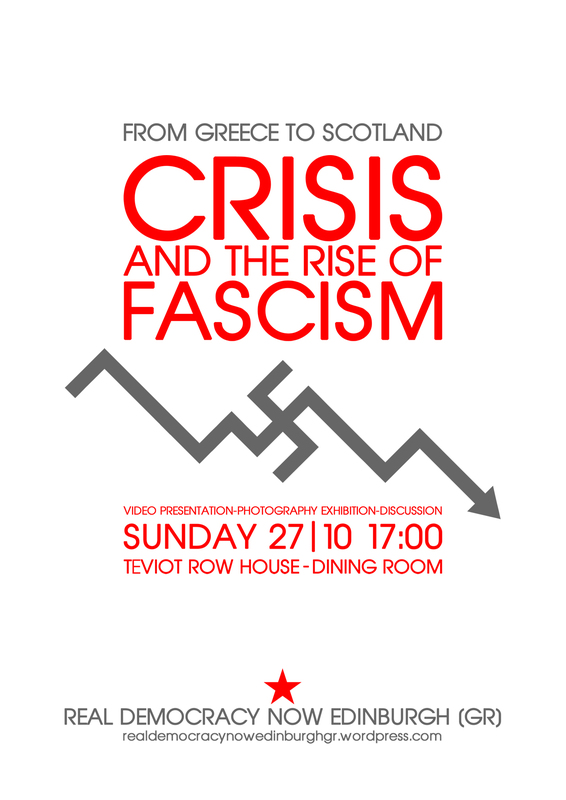 Join us on Sunday October 27, 2013 at 5pm to the open discussion/video presentation and photography exhibition at Teviot Row House-Dining room.